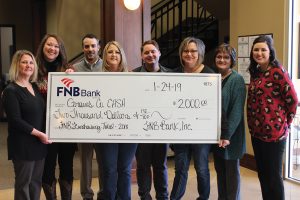 January 31, 2019 (Mayfield, KY) FNB proudly donated $4,000 to two worthy community agencies as a result of FNB’s 2018 philanthropic fundraising efforts in Graves County. Both the Mayfield-Graves County Child Advocacy (CASA) Program and the Feeding America Backpack Program for Mayfield and Graves County Schools received $2,000 donations to assist with their daily missions of serving the community. Throughout 2018, FNB employees coordinated and participated in numerous fundraising events benefiting the Mayfield-Graves CASA and Feeding America Backpack Programs. Various fundraising efforts included a Mayfield Creek Market box lunch fundraiser, a cookout, GCHS student car wash and concession sales during the Graves County and Mayfield Battle of the Birds football game. Employees also participated in various jean days throughout the year to benefit the worthy causes. Graves County’s CASA Program ensures that every child in Graves County has the opportunity to grow up in a safe environment by providing child abuse prevention programs and advocates for abused and neglected children in the court system. Graves County CASA operated with 19 volunteer advocates and advocated for a total of 97 children in the 2018 calendar year. 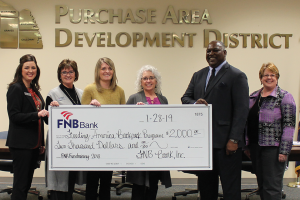 The Purchase Area Development District (PADD) serves as the region’s food bank supporting a network of organizations that distribute food and non-food products to underprivileged individuals and families. One of the most successful efforts in the fight against hunger is the PADD’s partnership with Feeding America, Kentucky’s Heartland linking their Backpack Program to school districts in our region. It provides children with nutritious, easy-to-prepare foods to eat on weekends when school food isn’t available. Teachers and family resource coordinators identify children in need, and a bag of easy-to- prepare food items is placed discreetly in the child’s backpack at the end of each week. Currently, the Feeding America Backpack program serves 157 children in 10 schools within Mayfield and Graves County. To learn more about Graves County’s CASA Program, please contact Stephanie Floyd, Executive Director at (270) 251-2060 or by e-mail at childadv1@calldialog.net. To learn more about the Feeding America Backpack Program, please contact the PADD Office at 270-251-6187. FNB Bank, founded in 1875, is one of the oldest banks in the state of Kentucky and ranks among the highest in the nation in the area of safety and soundness. The bank currently has eight locations: Mayfield Main, Mayfield Southside, Wingo, Lone Oak, Paducah, Murray, Cadiz Main, and Cadiz West. FNB is member FDIC and an Equal Housing Lender.